Metal Blade Records is proud to announce the worldwide signing of Brooklyn-based experimental metal outfit TOMBS. Blending bleak, post-punk minimalism with the ferocious attack of sludge and traditional black metal, TOMBS has established themselves as an act that's as committed to consistency as it is to growth, developing smoothly (but never predictably) over the course of their career, and earning a multitude of accolades along the way, including Album Of The Year from Decibel Magazine for 2011's Path Of Totality. In addition to their acclaimed releases, TOMBS has also become revered for their captivating live shows, touring extensively with an array of artists such as EYEHATEGOD, PELICAN, ISIS, WOLVES IN THE THRONE ROOM, THE SECRET, ULCERATE, and 1349, plus appearing at such renowned festivals as Roskilde Festival in Denmark, Roadburn in The Netherlands, and Psycho California and Maryland Deathfest in the US. Now, having joined Metal Blade's roster, the quintet is poised to continue the momentum that's been building since their formation in 2007. Mike Hill (guitar/vocals) comments: "Metal Blade is a legendary label that has put out legendary records by legendary bands. It's an honor to be part of the organization." 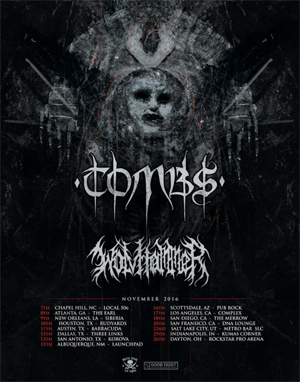 TOMBS will begin writing their fourth full-length and Metal Blade Records debut after their US headlining tour this Fall. Kicking off November 7th, the trek also features WOLVHAMMER as support. See below for all upcoming dates. TOMBS will be touring in support of their recently released All Empires Fall EP. For a preview of All Empires Fall, fans can visit the new TOMBS official YouTube page, where director's cut and behind-the-scenes videos for the album track, "V", can be viewed HERE.